During the last days I experienced the daily working life of a small editorial staff. The first month I learned above all about managing the online content and reporting the Berlin art scene, but as far the Berlin Art Week and ABC Fair ended, it was time to start thinking of the November/December print issue. We focused in renovating old memberships and looking for new ones to be able to cover all the production costs. I helped the team in finding new galleries and collaborations with art fairs as well as sponsors and media-partners. Thanks to this well conducted marketing policy, Bipgs can be a free-press art guide. I am joining the team in each of their activities, so they constantly involve me in making marketing researches, keeping contact with users, meeting art curators, reviewing interesting exhibitions and helping them to manage their social media channels. A really nice experience we had during last weeks was to have interviewed the director of one of the main important Berlin institutions. It was an inspiring chat and in that moment I figured out how a big institution could create cultural and educational programs mixing science and art. 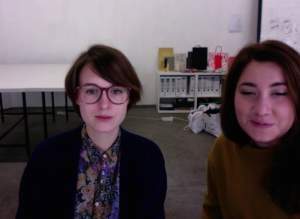 Working at Bpigs means also having the chance to meet the main personalities working in the Berlin cultural field and understanding what is happening in the German art sector, how it works for a young journalist running a magazine or for a young curator realizing his/her exhibition project. The city seems to be very open to young and fresh ideas and many project spaces open day after day. Me with Lisa, the managing editor at Bpigs, in the office located just in the centre of Berlin. In the picture below you can see a very peculiar happening at Haus der Kulturen der Welt, with whom we had a collaboration. 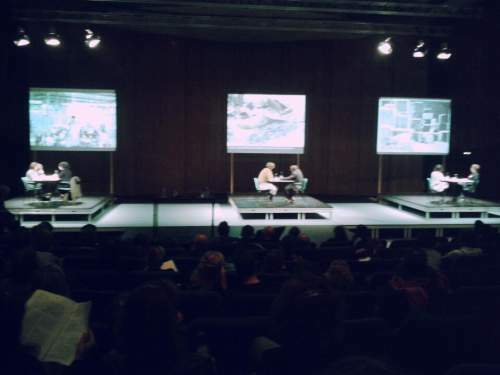 The happening, called “Dialogues on Three Parallel Channels: Speaking from prison. Dreaming Collectives. Speaking from the Laboratory.”, was astonishing and hundreds of people were listening carefully from their headphones. An impressive moment. I tried to make a brief summary of all the experiences I am having with my EYE, but almost two months are left… let’s see what else will happen!